Converting the given inequation into equation we obtain, x + y = 0. Putting x = 3, we get y = -3. We plot these points and join them by a thick line. This lines divider the xy - plane in two parts. To determine the region represented by the given inequality consider the inequality. This region represents the solution set of the given inequations. Converting the inequation into equation, we obtain, x + 2y = 6. We plot these points and join them by a thick line. This lines divider the xy - plane in two park. To determine the region represented by the given inequality consider the point 0(0, 0). Clearly, 0(0, 0) does not satisfies the inequality. Converting the inequation into equation, we obtain, x = - 2. Clearly, it is a line parallel to y-axis. 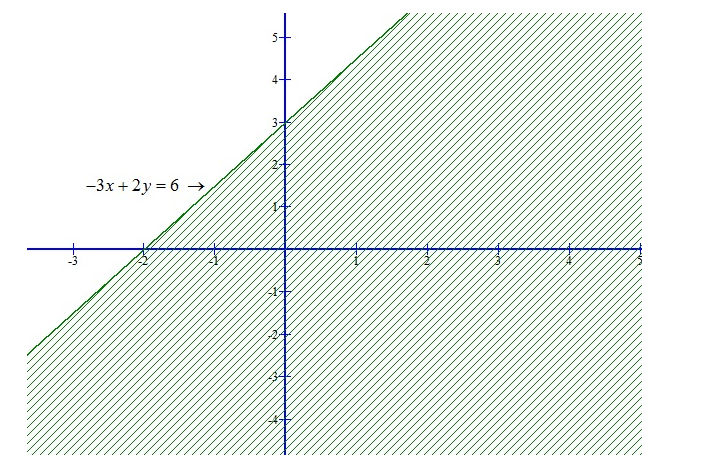 This line divides the xy - plane in two parts. 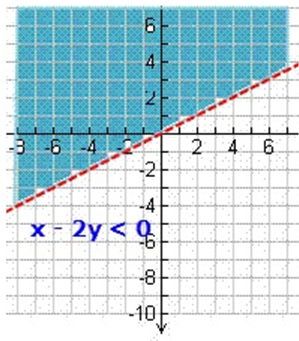 One part on the LHS of x = -2 and the other on its RHS. It is not possible. Clearly 0(0, 0) does not satisfy the inequality. 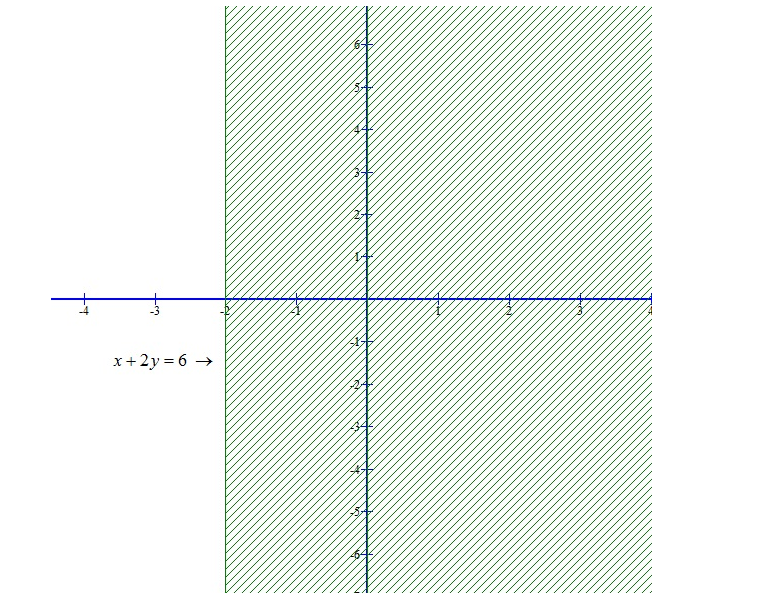 Converting the given inequation into equation, we obtain, -3x +2y = 6.
we plot these points and join them by a thick line. This line meets x-axis at (-2, 0) and y-axis at (0, 3). This line divides the xy-plan into two parts. To determine the region represented by the given inequality, consider the point 0(0, 0). Clearly, (0, 0) satisfies the inequality. So the region containing the origin is represented by the given in equation as shown below. Converting the given in equation into equation, we obtain, x = 8 - 4y. So, this line meets x-axis at (8, 0) and y-axis at (0, 2). we plot these points and join them by a thick line. 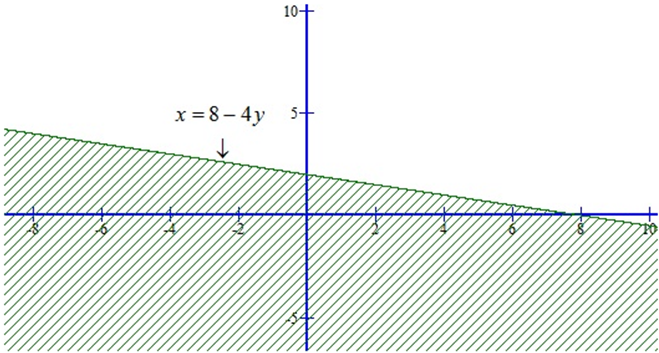 This line divides the xy-plane in two parts. To determine the region represented the given inequality consider the point 0(0, 0). Converting the given in equation into equation, we obtain, 2x - 5y + 10 = 0. So, this line meets x-axis at (-5, 0) and y-axis at (0, 2). we plot these points and join them by a thick line. This line divides the xy-plane in two parts. To determine the region represented by the given inequality consider the point 0(0, 0). Converting the given inequation into equation, we obtain, 3y = 6 - 2x. So, this line meets x-axis at (3, 0) and y-axis at (0, 2). we plot these points and join them by a thick line. 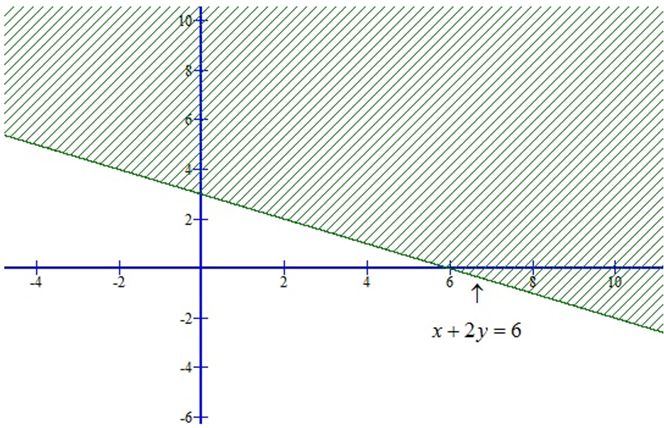 This line divides the xy-plane in two parts. 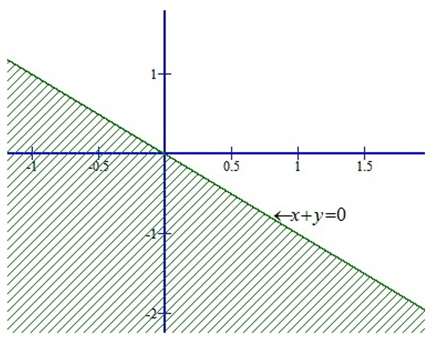 To determine the region represented by the given inequality consider the point 0(0, 0). Putting x = 0 and y = 0 in the inequation (i), we get 0 ≥ 6 it is not possible. ∴ we find that the point (0,0) does not satisfy the equation 3y ≥ 6 - 2x.